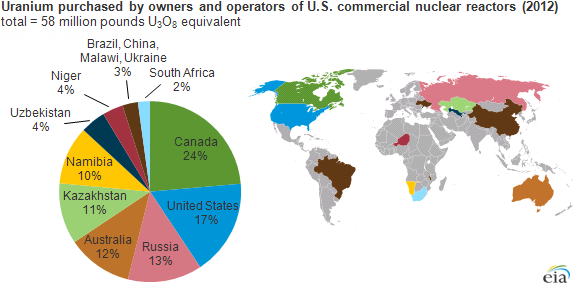 Owners and operators of U.S. commercial nuclear power reactors buy uranium in various forms as well as enrichment services from other countries. U.S. nuclear plants purchased 58 million pounds of uranium in 2012 from both domestic and foreign suppliers; 83% of this total was of foreign origin. About 38% of the enriched uranium needed to fabricate fuel for U.S. reactors was supplied by foreign enrichers. Owners and operators of commercial nuclear power reactors buy uranium in the form of uranium concentrate, uranium hexafluoride, and/or enriched uranium. If uranium is purchased after the enrichment process, the only step remaining is the fabrication into nuclear fuel. Historically, U.S. owners and operators have purchased most of their uranium from foreign countries. In 2012, 84% of foreign-supplied uranium came from Canada, Russia, Australia, Kazakhstan, and Namibia. The rest came from Uzbekistan, Niger, South Africa, Brazil, China, Malawi, and Ukraine. Uranium purchased earlier in the nuclear fuel cycle, such as the purchase of uranium concentrate, must be converted to natural uranium hexafluoride and enriched before reactor fuel can be fabricated. The owners and operators of U.S. commercial nuclear power reactors pay for conversion, enrichment, and fabrication. During 2012, a total of 52 million pounds of uranium hexafluoride (UF6) was delivered to enrichers in China, France, Germany, Netherlands, Russia, United Kingdom, and the United States. Enrichers in the United States received 62% of the deliveries, and the remaining 38% went to foreign enrichers. The capacity of enrichment plants is measured in terms of separative work units (SWU). SWU is a measure of how much work it takes to enrich uranium. In 2012, the average price per SWU was $141.36, and owners and operators of U.S. commercial nuclear power reactors purchased enrichment services totaling 16 million SWU. This represents a total cost to the owners and operators of U.S. commercial nuclear power reactors of about $2.3 billion.